During the break, after the smoke offering Massing Clouds of Amrita had ended on Sunday morning, the stage needed to be cleared and rearranged in order for Gyaltsab Rinpoche to bestow the Red Crown ceremony and the Long Life Empowerment of the Three Roots Combined. His Holiness the 17th Karmapa personally took charge of arranging Gyaltsab Rinpoche’s throne with great respect and care; he had received the Empowerment of the Three Roots Combined from Gyaltsab Rinpoche when he bestowed the Treasury of Precious Terma, or Rinchen Terdzo empowerments some years earlier. Gyaltsab Rinpoche’s throne was placed directly in front of the Gyalwang Karmapa’s high throne. To the right, on an elegant golden table covered with brocade, sat a delicately wrought silver pavilion. 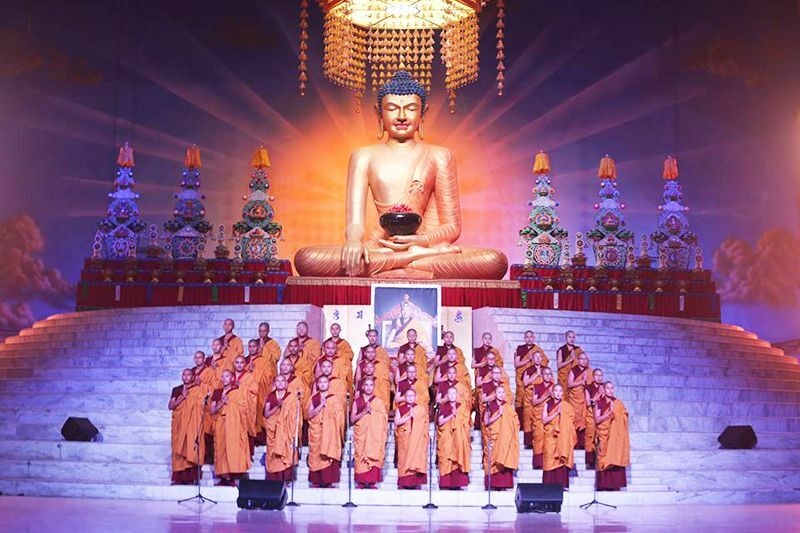 At last the stage was set, the gyalings blew, and the sangha returned from the break to take their seats. After several minutes, the Gyalwang Karmapa led an elderly Theravadin monk from Bangladesh and his small entourage onto the stage. He had come bearing a special gift for the Karmapa, which with reverence His Holiness placed inside the silver pavilion, before taking his seat on a throne to the front right of Gyaltsab Rinpoche’s. At last the time had come for the momentous occasion of the Red Crown ceremony. This would be of special historical importance since it was the first time that a Vajra Crown ceremony had ever been performed in Bodhgaya, the site of Buddha Shakyamuni’s enlightenment. Under instructions from the 17th Karmapa, the 12th Goshir Gyaltsab Rinpoche had agreed to perform the Vajra Crown ceremony this year during the Kagyu Monlam’s extended program. Each lineage of Tibetan Buddhism has its own style of ceremonial hats with their own particular symbolic meanings. The hats can represent the guru, and they may represent the lineage. Sometimes they are symbols of the special noble qualities of the guru himself, as is true of the Gyalwang Karmapa’s Black Crown. The Gyalwang Karmapas began the tradition of Vajra Crown ceremonies utilizing the Black Crown, which is particular to them. Karma Pakshi, the Second Gyalwang Karmapa, stated that whoever witnesses the crown ceremony will not fall into the lower realms. Later, various Gyalwang Karmapas bestowed red crowns upon Shamar Rinpoche, Situ Rinpoche, and Gyaltsab Rinpoche. 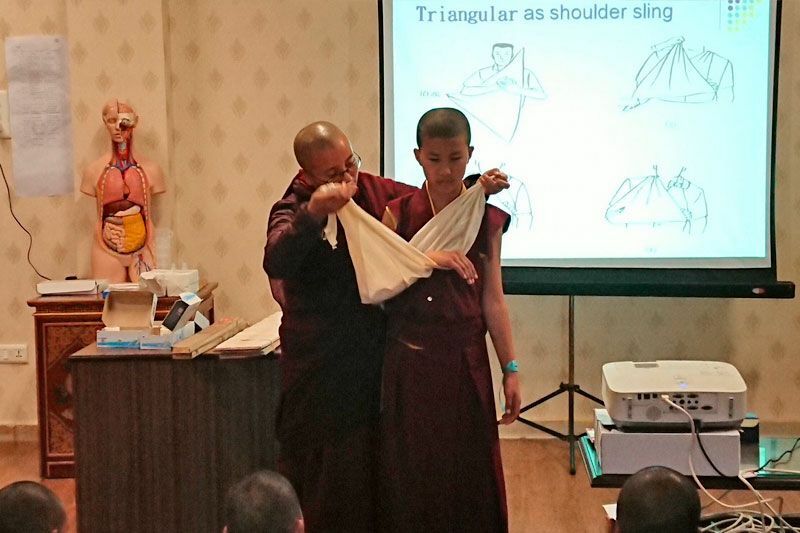 Thus crown ceremonies became an important aspect of the Kamtsang Kagyu lineage. Beholding the Vajra Crowns is said to grant liberation upon sight. However, this doesn’t mean that one is liberated in the very moment of seeing them, but rather that beholding the crowns plants the seed of future liberation in one’s being. The Fifth Dalai Lama recounts in his biography of the Third Dalai Lama, Sonam Gyatso, that this master approached Gyalwang Wangchuk Dorje (the Ninth Karmapa), and requested him to perform the Black Crown ceremony. Afterwards, the Dalai Lama asked if he could inspect the vajra crown, and when Wangchuk Dorje handed it to him, the crown remained suspended in space, prompting the Dalai Lama to exclaim that the Black Crown is quite special indeed! When the crown ceremony is performed, participants are given an opportunity to sponsor the event. 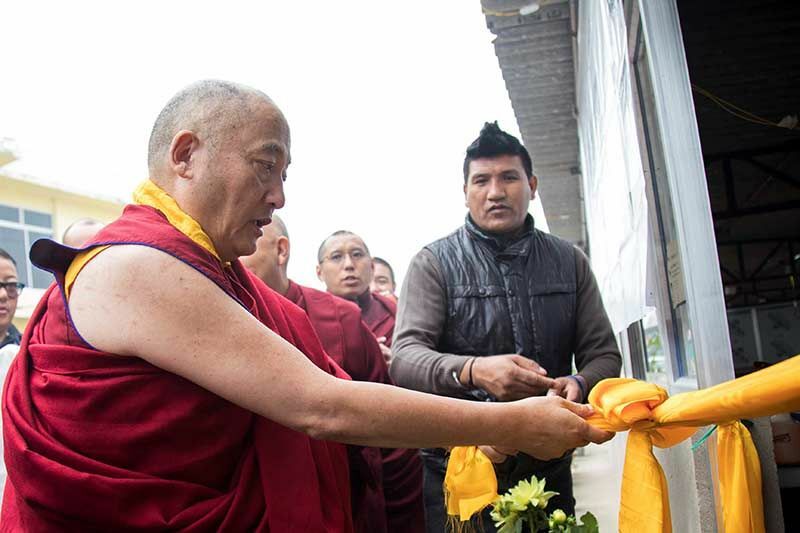 There is a tradition of requesting lamas to grant empowerments, teachings, and such ceremonies. Sponsorship is an expression of an individual’s interest in receiving what the lama is offering. Therefore, the opportunity to sponsor the crown ceremony is extended to all would-be participants. Additionally, special blessing pills are distributed to the sponsors. In general, any of the pills can be taken at any time, and one is enough. They can also be crushed and put in liquids to share with others, including animals. Since these blessings contains very sacred substances blessed by many great masters and have been preserved for many generations, it is important to keep them in a clean place of respect and to take them with devotion. There are several types of pills that may be distributed during the Vajra Crown Ceremony. The Pills of Immortality are especially beneficial for long life and can be taken at any time, especially when someone is sick. The Four Relics and Other Special Substances contain a vast assortment of blessed substances from the New and Old Schools of Tibet. They can be taken anytime as a general blessing. The Pills of the Seven Births are made of samaya substances and are particularly beneficial to practitioners of the Vajrayana. The Cleansing Pills are meant to remove obstacles and negativity. They can be taken anytime and especially as a cleansing before important retreats or practices. The Resplendent Nectar Dharma Pills are considered extremely sacred and can be used in inner offerings and sacred drink during ganachakras. Further, just tasting a speck of this guarantees that one day one will attain the state buddhahood. 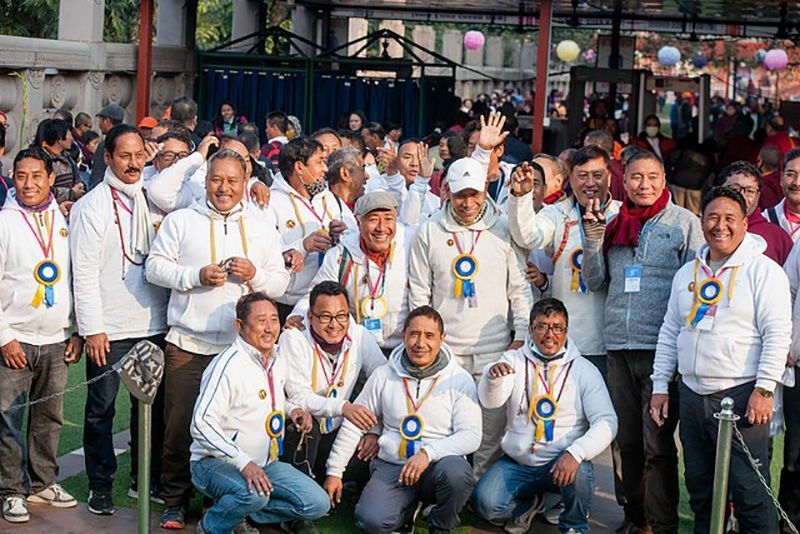 The Seven Birth Mani Pills are blessed by masters of the practice of Chenrezig to create a positive connection to develop compassion and benefit beings. While gathered here in Bodhgaya, the site of the Bodhi tree under which the 1002 buddhas of this fortunate eon will attain enlightenment, here in this grand Pavilion of the Kagyu Monlam, we would like to offer our respect with body, speech, and mind, to the Sixth Buddha, the Gyalwang Karmapa, Ogyen Drodhul Trinley Dorje, and on behalf of the Palchen Choling Labrang, we would like to welcome and offer all of you Tashi Delek. Tashi Delek to the khenpos, the tulkus, the geshes, lamas, monks and nuns, and especially the Kagyu Monlam committees, as well as all the devotees gathered here. After the elaborate rituals of the Grand Mahakala Puja or the Tsechu Ritual, there is a tradition of the Gyalwang Karmapa or one of his heart sons performing a Vajra Crown ceremony. Therefore, as the elaborate offerings to the Kagyu Protectors have been auspiciously concluded, per the instructions of the Gyalwang Karmapa, His Eminence Gyaltsab Rinpoche will now perform the Red Vajra Crown Ceremony. Before His Eminence begins, please allow us to present a brief history of the Vajra Crowns, and the benefits of witnessing the Vajra Crown Ceremony. I prostrate to him whose fame stretches above all like a white parasol. I prostrate at the feet of the great Goshir Gyaltsapa. On account of their exceptional resolve and aspirations, the buddhas and bodhisattvas engage in inconceivable awakened activity. Among these acts that are meant to be seen and heard, is the ceremonial donning of vajra crowns. These sacred rituals that plant the seed of liberation upon sight, have ripened and liberated countless disciples. This tradition of performing vajra crown ceremonies, is particular to the practice lineage of the Karma Kamtsang and is exclusive to the Gyalwang Karmapas and his heart sons. We find reference to crowns in both the vehicle of characteristics, the sutras, and in the vajra vehicle of the tantras. The sutras recount that before Sakyamuni Buddha appeared in this world, he was residing in the god realm of Tushita, where he was known as Lha’i Bu Dampa Tok Karpo. When departing the god realm for this world, he took his crown and he placed it upon the head of the victor Maitreya, thus empowering him as his regent. It is said that Maitreya currently resides in Tushita performing the first of the twelve deeds of the supreme nirmanakaya--teaching to benefit the gods. In the secret mantrayana, through the crown empowerment of Ratnasambhava, one is enthroned as a great universal ruler, who lords over the three realms, and is placed upon the great lion throne of the utter victory of non-abiding nirvana, free from the extremes of both conditioned existence and peace. The Black Crown of the glorious Gyalwang Karmapas was presented to him long ago, when he took birth as the sage, Konpa Kye, on the northern side of Mount Meru. At that time the buddhas empowered him with a crown fashioned of single strands of hair from 320 million dakinis. Beings whose obscurations are subtle perceive the Black Crown as ever present above the head of all the incarnations of the Gyalwang Karmapas. But for the benefit of childlike beings ensnared in a thicket of coarse obscurations, a physical Black Crown was fashioned, a symbolic representation of the true crown’s essence, and decorated with various precious gems and a gold blaze. Subsequently, a red crown with a golden blaze that liberates upon sight was consecrated through the practice of Lama Gondu. Having been blessed as the essence of vajra speech, Amitabha, it was placed on the head of the 2nd Gyaltsab, Tashi Namgyal. Gyalwang Chödrak Gyamtso then proclaimed that the mind of the teacher and student had become undifferentiated and he thus appointed Gyaltsab Tashi Namgyal as his regent to turn the wheel of dharma. The Karmapa continued, saying that with the Vajra Crown remaining inseparable from the Gyaltsapas, it will create auspicious conditions to sustain all the Buddha’s teachings in general, and in particular, the long-standing tradition that is the essence of the Practice Lineage. He then recited verses, scattering flowers of auspiciousness. When witnessing the donning of the Vajra Crown, you should have unwavering faith in the support, the Vajra Crown, and focus one-pointedly on this exalted object. At that time and at all times, one should supplicate with devotion while meditating that the lama is the embodiment of all refuges, and situated above your head. You should sustain the mind’s natural state without altering it, and should strive to train in loving kindness, compassion, and bodhichitta. These are the attitudes to hold during the ceremony itself, and also the benefits of witnessing the ritual. Those who possess black and red crowns, the Gyalwang Karmapas and their heart sons, are the crown jewels of the teachings and beings. By regarding them as the eyes in your forehead and the hearts in your bodies, you should rouse the three faiths: clear faith, (an utterly lucid mind that is not contaminated by any obscuration of selfish attachment or aversion), the faith that longs to truly manifest the ultimate result, and the faith of conviction welling up from the depths of your being. Giving rise to these, you should sustain the nature of mind itself, and train the mind in loving kindness, compassion, and bodhichitta. Accumulated over thousands of kalpas. The most desirable things of this life will be obtained according to one’s wishes. 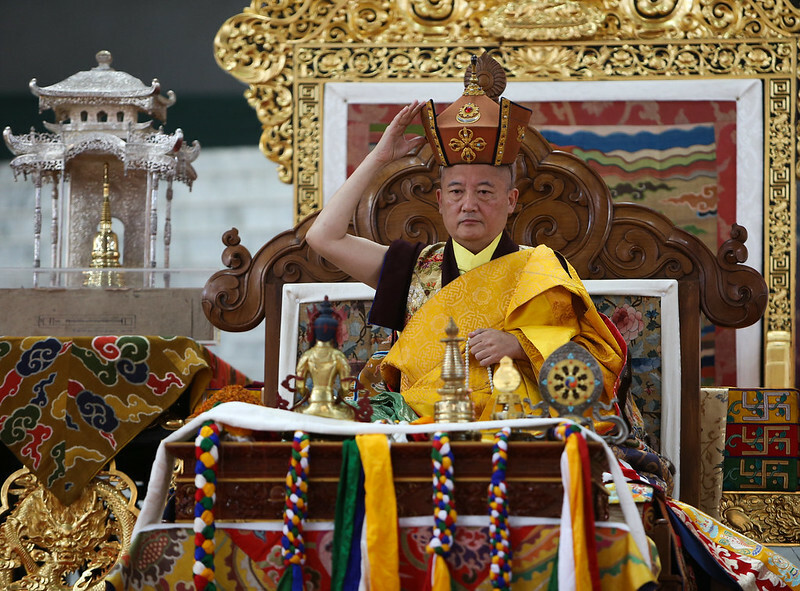 Following this auspicious announcement, His Eminence Goshir Gyaltsab Rinpoche performed the Red Crown ceremony twice. At this time, the special blessing pills mentioned above were distributed to the sponsors of the ceremony, after which Rinpoche bestowed the Long Life Empowerment of the Three Roots Combined.